This article originally appeared on Openfit. Despite what its name might suggest, tennis elbow isn’t exclusive to Wimbledon hopefuls. In fact, according to Trevor Thieme, C.S.C.S., Openfit’s senior manager of fitness and nutrition content, just 10 percent of cases of tennis elbow pain actually occur in tennis players. However, tennis elbow isn’t a foregone conclusion for racket-wielding athletes and those who work with their hands. If you’re presently experiencing pain in your elbow, your first course of action should be to consult a healthcare practitioner. But by incorporating tennis elbow exercises and stretches into your regular fitness routine, you can help prevent this common injury. Put simply, small tears in the tendon that joins the forearm muscles to the elbow generate pain and tenderness. “Patients suffering with this will typically complain of pain over something as simple as lifting a cup of coffee,” Badia says. Tennis elbow affects roughly 1 to 3 percent of the population annually. As previously mentioned, excessive, repetitive movements can lead to tennis elbow. But you’re more susceptible to it if you lack the necessary strength, mobility, and flexibilityto perform those movements, explains Richard Sedillo, PT, certified orthopedic manual therapist at Arizona Manual Therapy Centers. “These repetitive motions require a lot of stability of other structures. So, when those structures are weak, the fatigue happens more quickly,” he says. After a thorough assessment with each patient, Sedillo crafts a customized program designed to increase strength and restore mobility wherever it’s lacking. 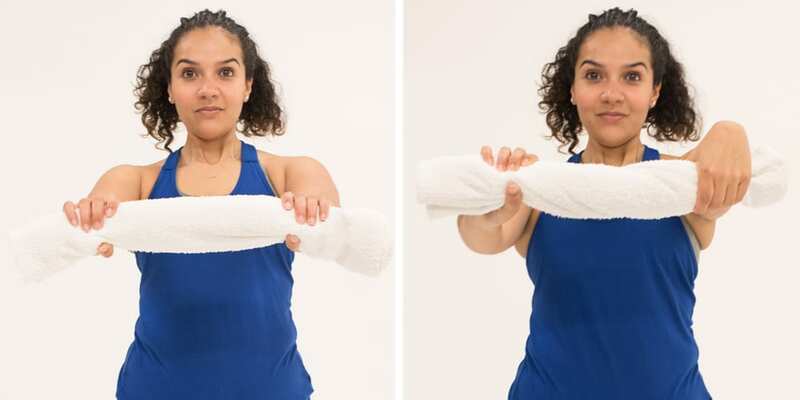 Intended to help prevent tennis elbow, these strengthening exercises target the hand, finger, and forearm muscles, and should be performed frequently (every day if possible). As you perform each movement, Sedillo recommends repeatedly switching arm positions in order to work the muscles from all angles. 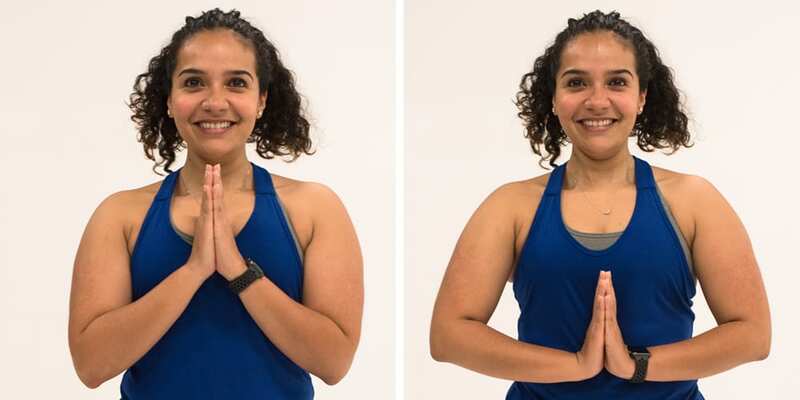 Try extending your arms in front of you, bending your elbows (so that your forearms are perpendicular to the floor), lifting your arms overhead and to the sides, and reaching your hands behind you. But be sure to hold each position long enough to feel muscle fatigue (aim for a 5 on a scale of 1 to 10, where 10 is failure). Hold a ball (a rolled-up sock also works) in one hand. Squeeze the ball for a count of three, and then relax your grip. Continue squeezing and releasing until the muscles feel fatigued. 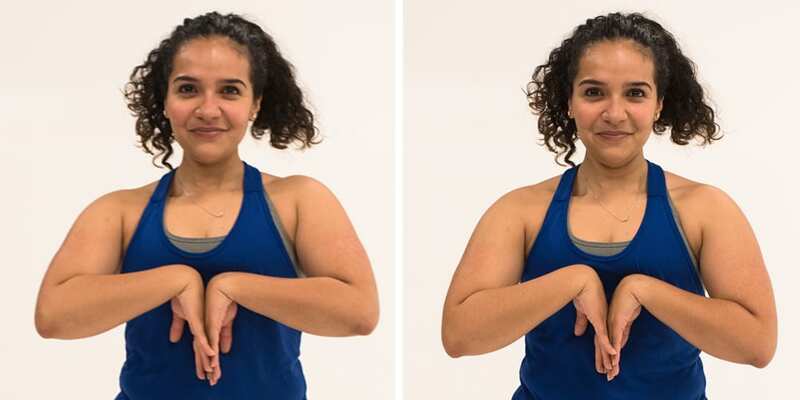 In addition to varying arm positioning, try this exercise with your palm facing both up and down. Hold the ends of a small hand towel out in front of you. Twist the towel as if you were wringing out excess water, then untwist it. Repeat the movements until the muscles are fatigued. 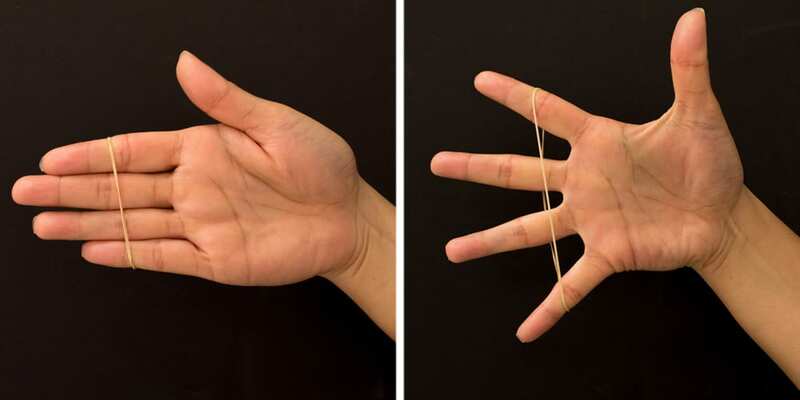 Slip a rubber band over all five fingers. Repeatedly open and close your fingers until the muscles are fatigued. 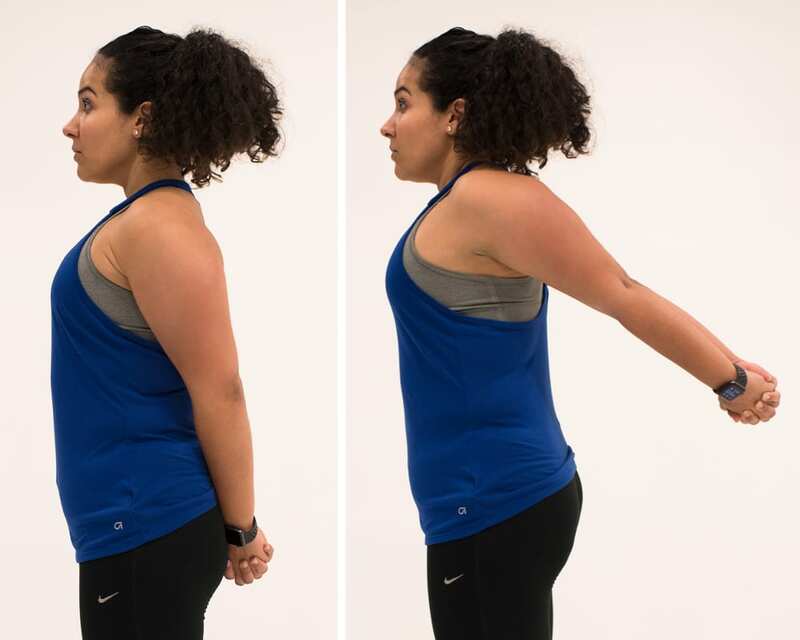 In addition to varying arm positioning, try this exercise with your palm facing up and down. Maintaining mobility and flexibility in the hands, fingers, and forearms can also help prevent tennis elbow. Like strengthening exercises, these stretches can be performed on a daily basis. Sedillo recommends aiming for three sets of five reps, holding each stretch for 30 seconds. Standing in an upright position, bring your palms together in front of you in prayer position. This is the starting position. Gently press your palms together as you lower your hands. Once you feel a stretch in your wrists, hold the position, and then slowly return to the starting position. Standing in an upright position, bring the backs of your hands together in front of you, fingers pointing toward the floor. Lower your elbows relative to your hands until you feel a stretch in the backs of your wrists. Hold, and then slowly return to the starting position. From a standing position, extend your arm straight in front of you, and rotate your wrist so that it’s in a thumb-up position. 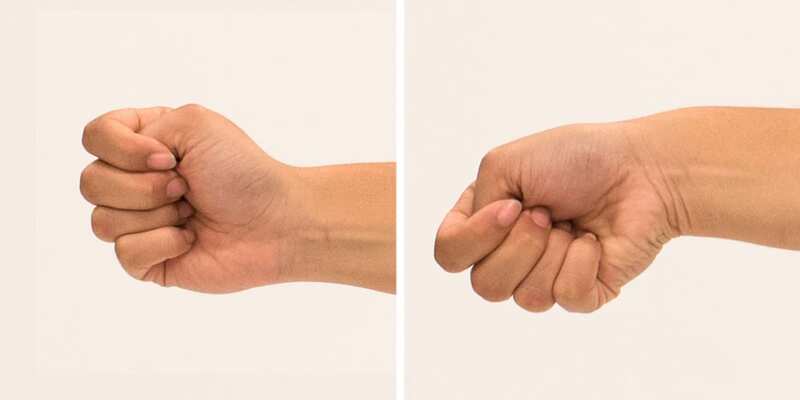 Tuck your thumb under your fingers, then bend your wrist so that your fingers are moving toward the floor and you feel a stretch in the side of your wrist. Hold, and gently release. Then switch arms, and repeat. Stand in an upright position and clasp your hands behind your back. Straighten your arms and gently raise them toward the ceiling until you feel a stretch in your chest and biceps.